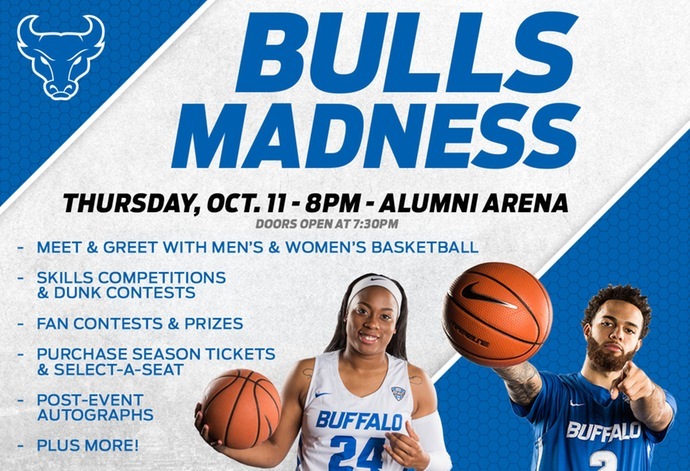 BUFFALO, N.Y. -- Fans will have their first chance to meet the 2018-19 men's and women's basketball teams on Thursday night as the Division of Athletics will host Bulls Madness at Alumni Arena to help kickoff Homecoming Weekend on campus. The event is free and it will include team introductions, shooting competitions, a dunk contest, autograph sessions, and much more. 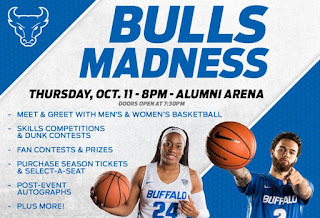 The UB ticketing staff will also be on hand Thursday night for those looking to purchase tickets. Season tickets are still available for $160 and new this year is a women's only package for $75. Last season, both teams advanced to the NCAA Tournament and both squads picked up their first ever tournament wins. The men won the 2018 MAC Tournament and upset PAC-12 champion Arizona in the first round, while the women's team became just the third MAC team ever to advance to the Sweet Sixteen following wins over South Florida and Florida State. For those unable to make it on Thursday evening, Bulls Madness will be broadcasted live on ESPN3.